Pop Culture Junkie: Tuesday Thingers! Today's question: Work multiples. Do you own multiple copies of any books? Which ones? Why? Can you share your list? You can find the link under Statistics, from either your home page or profile. I only have one book that I have multiples of. Holidays on Ice by David Sedaris. Librarything claims I have two other books with multiple copies but they aren't the same book, just similar! Lying Librarything! Do you have any multiple copies? thatonegirlemily- Yeah I usually give them to my sister! veens- LOL! It was totally lying! 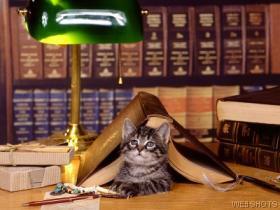 literary feline- Yeah. I thought I knew what my duplicate was (i did) and if I didn't I think I would wonder why i had it!